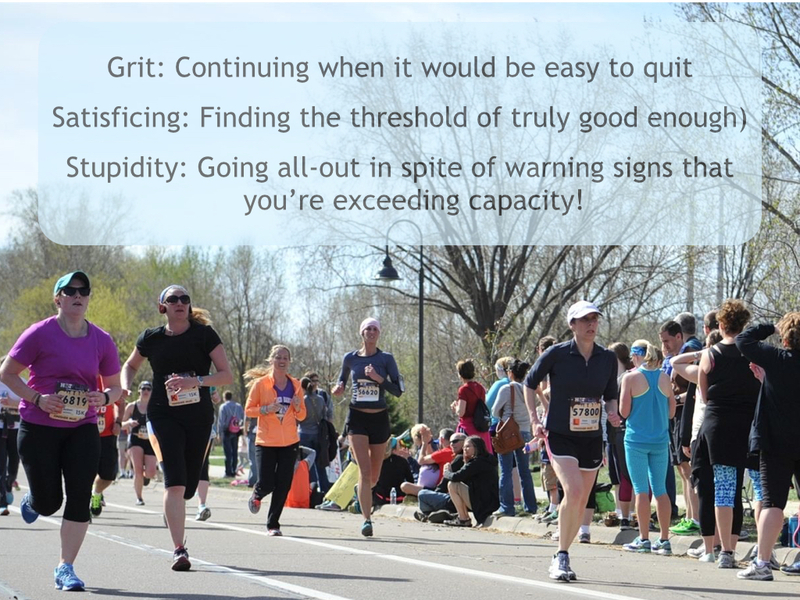 Grit: Too Little, Too Much, or Just Right? BlogHome » Blog » Grit: Too Little, Too Much, or Just Right? Satisficing (finding the threshold of truly good enough): That sweet spot on the continuum of effort that stretches you yet stays within your current capacity. In this case, simply finishing stretched my capacity; I didn’t chastise myself for going a bit slower than usual! Stupidity: Going all-out in spite of warning signs that you’re exceeding capacity. Why am I writing about this? Because “Grit” is being touted as a miracle cure for all kinds of ills—for students struggling with tough academic standards, for employees who complain about too much to do and too little time, for every one of us who has a dream we aren’t sure we can accomplish. Google the word and you’ll find TED talks, research articles, blogs and more that discuss grit as the key to success. Most of it is good stuff. BUT…this kind of either/or thinking—either you lack motivation OR you have grit—isn’t helpful when the “solution” is really a continuum. The real key to success is knowing when to persevere, when to get help, and when to find a different goal to pursue. So what does finding the sweet spot between lack of motivation and grit look like outside of exercise? For leaders, it involves taking a hard look at the time, energy and resources required to meet a goal. Yes you can ask people to do more with less, but if you think that’s how NASA landed a man on the moon, check out my blog Does Your Vision Need a Reality Check? For educators, it’s ensuring that tasks are within that zone of proximal development—what the student is truly ready to do, not what arbitrary standards say they should be doing right now. Students who avoid working on tasks they are currently incapable of completing are actually showing a high level of street smarts. In my next blog, I’ll discuss how emphasizing grit also needs to include emphasizing how and when to persevere, quit, and/or ask for help! Outstanding! I’m going to share it with my contacts and in the class that I am teaching this afternoon. Thanks, Jane! next post: If Grit is the Answer, You’ve Got Problems!